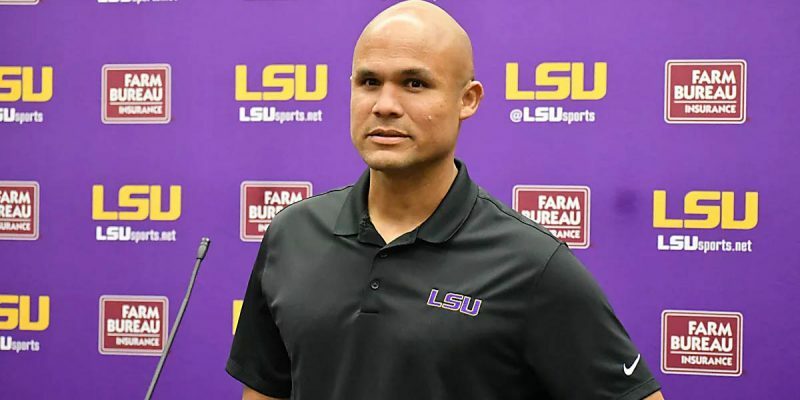 The word is Dave Aranda will remain as LSU’s defensive coordinator, with a new four-year, $10 million contract to be an assistant coach. Orgeron made his statement in a social media message posted Wednesday, after NOLA.com | The Times-Picayune confirmed a Houston Chronicle report that Texas A&M had redoubled its effort at luring the top-paid assistant coach in college football from Baton Rouge. A new contract for Aranda, 41, will span four years and pay him $2.5 million annually, according to an LSU source. That would keep him at LSU through the 2021 season, which would match the length of Orgeron’s contract for $3.5 million per year. The university paid Aranda $1.8 million in 2017, and he was due to receive a raise over the remaining two years of his current contract, to $1.85 million in 2018 and $1.9 million in 2019. I’m very happy to report Dave Aranda has agreed to be with our program for years to come. Thanks to Joe Alleva, Dr. Alexander and the board of supervisors for their support in making this happen. Geaux Tigers. So it appears a major bullet was dodged on Wednesday, and LSU fans ought to be happy to hang on to Aranda. The Tigers fielded a Top 20 defense in 2017 (finishing 12th in total defense and 14th in scoring defense) despite losing seven – or eight, depending on how they’re counted – starters off the 2016 unit, including two first round picks and five players (Jamal Adams, Tre’Davious White, Davon Godchaux, Kendell Beckwith and Duke Riley) who started as rookies in the NFL with another two (Dwayne Thomas and Lewis Neal) who also were on NFL rosters. To boot, the best player on the defense, outside linebacker Arden Key, had an unproductive offseason and reported to camp out of shape, was only himself for two or three games in the middle of the season and then promptly got hurt and missed the stretch run. Not to mention the Tigers’ best defensive lineman Rashard Lawrence struggled with problems with both ankles all year. And yet LSU’s defense was still one of the best in the country. That’s a pretty amazing feat, and with what appears to be a good bit less in terms of losses for 2018 it’s not unreasonable to think Aranda might have his best unit yet on the way. Keeping him is a major bullet dodged, and a key part of preserving optimism as to LSU’s football future. Of course, with Aranda staying at a $700,000 raise, extra scrutiny will now come on the other side of the football – because with the extra outlay for Aranda, one has to wonder if LSU can really afford to take on a buyout of Matt Canada’s contract as offensive coordinator now. That’s a $3 million hit to the pocketbook over the next two years, minus whatever money Canada might make in that time in another job. Wednesday saw reports that Canada might be engaged in talks with Rutgers to serve as that school’s offensive coordinator in 2018, but it’s unlikely Rutgers would pay more than $600,000 or $700,000 to their offensive coordinator – meaning LSU would be paying Rutgers’ offensive coordinator more than Rutgers would be paying their offensive coordinator, given a $1.5 million buyout figure for 2018. Another development on the coaching front could make that a more palatable proposition. Namely, that Arizona – who recently fired head coach Rich Rodriguez – is reportedly interested in former LSU head coach Les Miles as his replacement. Were that story to bear fruit it could relieve LSU of a $3 million buyout figure and free up a major chunk of otherwise dead money within the program’s budget. That would make the Canada situation much more tenable and open the door to head coach Ed Orgeron hiring an offensive coordinator with whom he meshes better than he has with Canada. In other words, despite the very reasonable panic many LSU fans have felt since losing the Citrus Bowl on Monday, things might well work out satisfactorily on the football coaching front…for now. That said, it’s quite legitimate to wonder whether the Aranda and Canada dramatics over the past several days don’t serve as an indictment of LSU’s new football business model which depends on high-profile coordinators to carry the program’s brand as much or more so than the head coach. After all, Alabama changes coordinators virtually every year and none of that turnover seems to attract even much notice much less negatively affect the team’s performance.